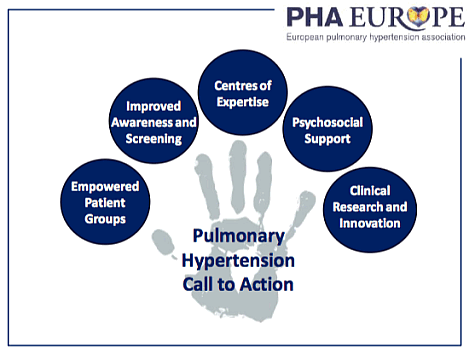 The aims of PHA Europe are summarized in its “Call to Action”, which identifies the main unmet needs of persons living with pulmonary hypertension and recommends effective ways to address those needs. The Call to action has been officially endorsed by the European Respiratory Society and was presented in the European Parliament in 2012 in the course of a public event hosted by MEPS Hannes Swoboda and Karen Kadenbach. See also section on Call to Action. Full text of Call to Action.